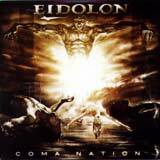 Eidolon returns with their latest opus, Coma Nation. Of major importance is the fact that Brian Soulard is no longer part of the band. According to the band's website, Brian was asked to leave the band due to "musical reasons." Hmmm… sounds to me like a polite way to say that Brian did not have what it takes, so he was fired. Anyway, enter new vocalist Pat Mulock as Ediolon's new vocalist. Now, this guy is good! His vocals soar with ease to the high notes and he can sustain those notes just like a siren (yeah, his delivery reminds me a bit of Bruce Dickinson in spots) without coming close to going out of tune. He also displays his ability to sing in the lower range as well upon occasion. Needless to say, the band recognized an area that needed improvement (vocals) and took the necessary, although probably difficult decision to replace their vocalist. This album is a non stop assault of heavy, heavy metal! Pummeling double bass, monster riffs everywhere, and memorable melodies are the main ingredients of the music of Eidolon. The musical style is 100% heavy metal, although the style is varied during the course of the album. Songs like Lost Voyage and From Below have a slower and sludgy feel, but manage to stay heavy thanks to some foreceful riffs and emotional vocals. Scarred, on the other hand has that classic bay area thrash sound (Exodus, Forbidden) while A Day of Infamy has a distinct Painkiller (but even heavier) flavor to it. The epic Pentacle Star offers the only moment to catch your breath with an acoustic intro, but the double bass kicks in after about a minute to let the head banging resume. No matter what particular style of metal is visited during the course of this album, the guys pull it off quite well. How can I not comment on the final track: Within the Gates is a devilish sounding eighteen (!!) minute epic. Complete with tempo changes and a haunting background growls in spots during the first half of the song, it is surely one of the standouts on the album. Pat Mulock's voice soars with the speedy first half of the song, then he dips into the lower range of things during the middle of the song and picks right back up when the tempo starts pounding again. Just like the rest of the album, riffs, solos, and furious drumming are plentiful during the course of this epic. The dual guitar solos during the last few minutes of the song combined with the siren like vocals give allow the song to finish in somewhat Maiden-esque fashion. If you've overlooked this band in the past due to the below average vocals, I suggest you give Eidolon another listen. The vocals are much improved, and the music is still very heavy and even more varied than in the past. Riffs are the rule of the album, and the furious drumming keeps the energy level at the maximum throughout. If you like no frills, classic heavy metal delivered right in your face, this is a great album for you!